THEFAF ALRAFIDAIN Co. has been awarded the contract by the local Governorate in Kirkuk province. 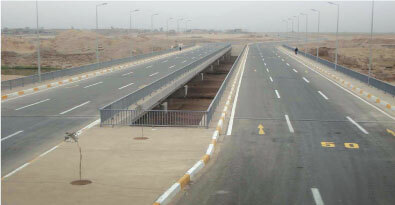 This Bridge is located south of Kirkuk on Khasah River with a length of 300 meters. The work included soil investigation, excavation works for concrete piers, casting in situ reinforced concrete footings, casting the cross beams, supplying and installing typical concrete girders, and casting the deck slab in order to supply and install guard rail for both sides with lighting poles and ﬁxtures.